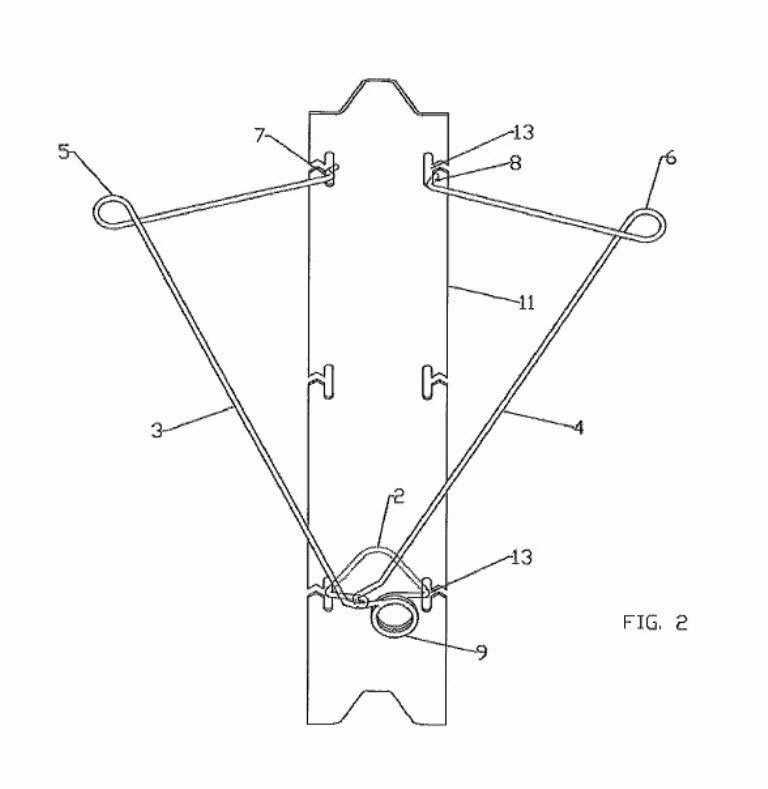 Spacer Device for Vine Support Wires, Methods for Its Operation and Vine Support Assemblies comprising the same. The present application in the Us national stage of International application PCT/IB2011/052651 filed on Jun 17, 2011, which, in turn, claims priority to Italian Patent Application MI2010A001118 filed on Jun 18, 2010. SPRING SPREADER FOR HIGHWAY POST "OMEGA"
SPRING SPREADER FOR T-POST " T-SHAPED"
The Technical Field of the present invention is taht of spacers used in the filed of viticulture for spacing apart the vine support wires which extend from opposite sides of a series of posts, planted in aligned and spaced apart positions in the soil of a vineyard. More specifically, the invention relates to a spacer device for vine support wires according to the preamble of clain 1. The inventino also relates to vine support assemblies and methods for the operation of a spacer device. The spacers (generally known as "spring spacers" since they are often made with wire which is resilient or resiliently deformable) are usually installed on the posts in the winter period, after prunning, or in the spring period, before the plant begins to shoot. 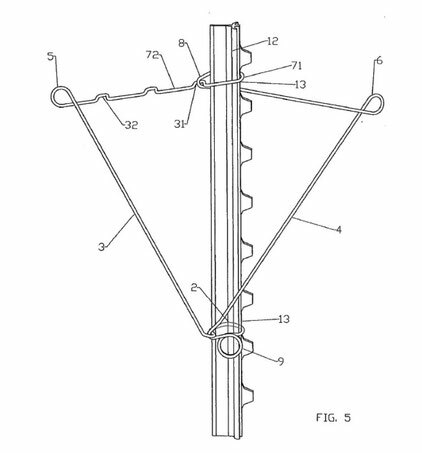 Once positioned on the posts of the vineyard, at predetermined heights, the spacers are placed in a open position, with the arms spread open, in order to hold aprat the vine wires, which pass into the rings of the spacers at a distance of approximately froty centimeters. In this phase the vine wires are not loeaaded. At the same time of shooting, towards April and May, the major art of the shoots come between the two wires and once it has passed over them is supported by same. In this phase, the spacers placed at the lower height are closed in order to contain the vegetation which passes beyond the vine wires and to ensure that it does not intrefere with the grape clusters which are below. By closing the spacers, i.e. bringing their arms close to one another, the distance between the vine wires is reduced. the following phase is that of closing the spacers plased at a higher level, usually in June or July, once the shoots have grown longer. The vegetatino is therefore supported and contained by the binary vineayrd wires in a compact and uniform way, making it possible for the plant to grow straight and in a upward direction. In this way, the clusters are well exposed to the sun and to the treatments carried out by the grower. Spring Type spacers of various knds are known which are suitable for being fixed to vineyard posts. 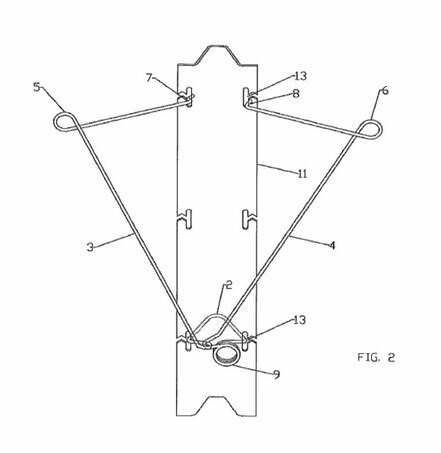 Our patent describes a spring type spacer suitable for being fixed to a post for vnes, comprising a frist and a second separate wires. The first wire, resiliently deformable, has a base portion suitable for encircling the post in a substantially horizontal postion, from which there extends a pari of arms shaped at their upper ends to form respective rings suitable for receiving and supporting the vine support wires. The second wire, also suitable for being mounted on the same post, is confifured in such a way as to form attaching means, suitable for retaining the arms of the first wire in the region of a intermediate sectino therefore. The attchment of the arms of the first wire to the second enables the arms to be brought together and the support wires, carried by the rings, closer to each other compared to the spaced apart position of the arms in which the support wires are spaced from each other. Unfortunatly, owing to the fact that it is made in two separate parts, the spacer whihc is the subject of WO 2009/106380 involves high manufactuting costs and greater difficulty of installation, quite apart from the need to control accurately the mutual placing of the two wires, so that spacer can be used effectively. Besides the fact that spacers are not known which are optimised for posts of "omega" - shaped or "T" - shaped cross section, i.è. for posts having lateral notches, the commercially available spacers have the drawback that, being hooked on to the post only in the lower region, they tip forwards when the weight of the vine tends to generate in the support wires the so-called "dune effect" which appears when between one centre line post and the other, the weight of the vine in the growing stage presses on the wires and consequelntly the whole of the vine drops down, creating significat problems in the trimming stage. The principal object of the present invention is to provide a spacer for vine support wires which is stable, i.è. 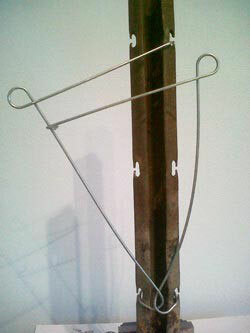 which is firmly attached to the post and which cannot tip even in the presence of thick vegetation; another object of the present invention is to provide a solution which lends itselfs to being optimised for vineyard posts having a "T-Shaped" or "Omega" - shaped cross section; a further object is to provide a solution which adapts to the various stags of growth of the vine. These and other objects are achieved by means of a spacer device having the features indicated in the appended claims which form an integral part of the present description. Further subjects of the invention are vine support assemblies and methods for the operation of a spcaer device for vine support wires, as claimed.